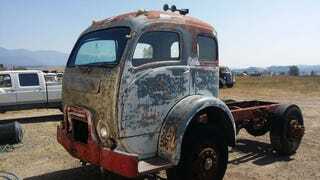 1951 white coe. Has an large cab that could be converted into an xcab or sleeper. No engine or transmission. Three small spots of minor sheetmetal skin rust. Easy repairs. Clear title. Rolls and steers. These make awesome rollback or ramp trucks. A couple pics are included of finished one, to see what they can look like. Affordable shipping available.